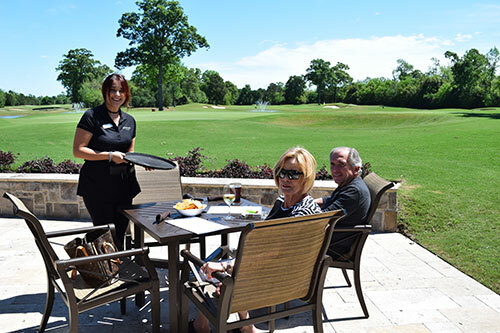 Whether for lunch after your round of golf, a steak dinner with the family, a drink at the full bar to watch the game on our giant 160 inch TV, Woodforest Grille is the perfect place to be. Our menu features ever-changing creations, kids options, signature drinks and more. When the weather is nice, enjoy outdoor dining and a glass of wine on our rock patio. The view is spectacular! See you soon at Woodforest Grille. Friday & Saturday: 7:00 a.m. – 9:30 p.m.
• Appropriate dining attire is worn at all times. • Children need to be monitored by their parents for the comfort of other guests and the safety of the children. • Outside food or beverages are not permitted on Woodforest property at anytime.